At DataRobot, we also saw this need. 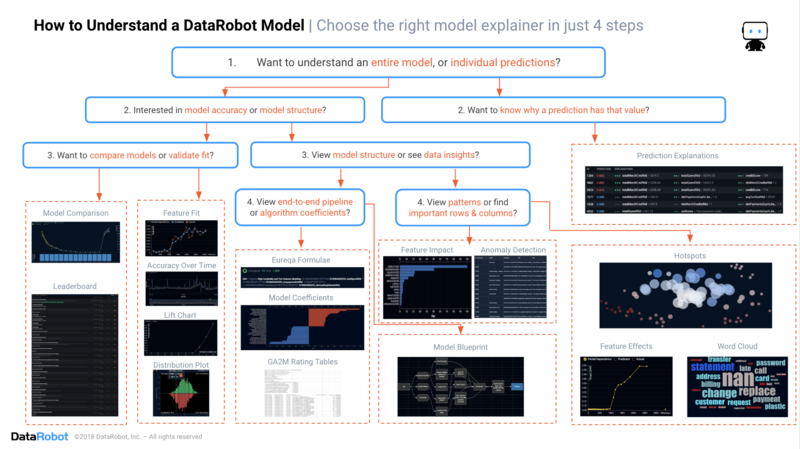 So, we built algorithms with human-friendly explanations that can be understood by ordinary business people, and we’ve created a cheat sheet that shows you how to quickly understand a DataRobot model. Trusting an AI is a matter of understanding how well it does its job and whether it undertakes that job in a sensible manner. But, understanding an AI can be as complex as understanding a human. Just as you would ask questions to a human to learn more about them, DataRobot recommends that you ask questions of your AI to better understand it. How accurate is it? When is it most accurate and when is it not so accurate? What process or pipeline did it follow? What patterns were found in the data? Why did the AI make a particular decision? Understanding a model is about seeing whether it is accurate, and seeing what patterns the model derived from the data. Understanding an individual prediction is about seeing why a particular data point resulted in a particular decision. We need to look at different model insights and diagnostics, depending upon what question we are asking, and that’s why we’ve created this cheat sheet showing you which insights and diagnostics answer each question that you ask. Over the next few weeks we will explain how to use these insights to answer each question you have. There’s no longer any need to settle for black-box models. Interpretable models are available that will explain, in human-friendly terms, why you can trust them. If your AI can’t answer these questions, then it’s time to upgrade to DataRobot for models that you can trust. Click here to arrange for a demonstration of DataRobot’s model interpretability.